Honeywell’s All-New VisionPRO 8000 is effortless to use. Its intuitive logic and menu-driven programming respond to your choices and schedule for optimal comfort and energy savings. VisionPRO offers you top-of-the-line features like touchscreen interaction, a real-time clock and a large, easy-to-read backlit display. 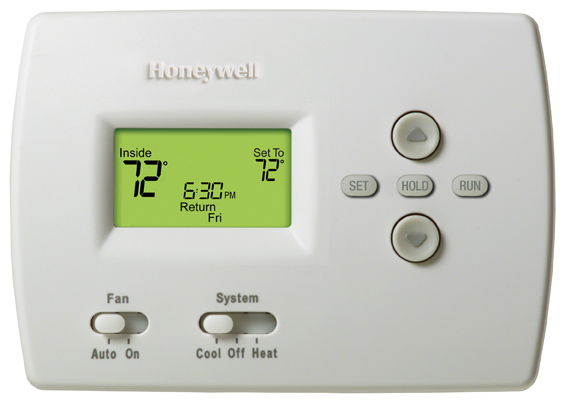 If you want your home to feel as comfortable as it looks, then VisionPRO is the thermostat for you. You’ll enjoy the convenience, energy savings and consistent comfort for years to come. An intelligent, simple, and intuitive control system for a high-efficiency natural gas furnace, the PRO 4000 is proudly Basic: Easy-to-use slide switches allow you to select the heat or cool mode, and operate the fan, and Weekday/Weekend Programming provides 5-2 (weekdays, weekend) programming to fit your lifestyle. The Mercury Free digital display shows both current and set temperature, and are easy to ready in various lighting conditions with a built in backlight.